robust demand for rental housing, while the modest rise in wages supported lease renewals. 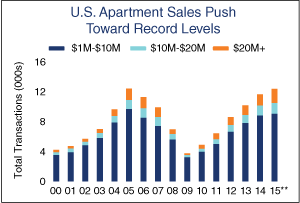 The slow but sturdy economic growth cycle, combined with positive demographic trends have lifted apartment sector performance and induced exceptionally vigorous investment momentum. lower by 40 basis points to 4.1 percent in the second quarter despite the most substantial pace of apartment construction in more than 20 years. 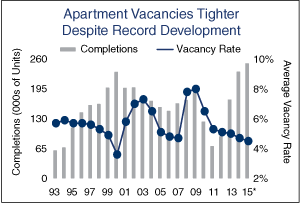 The vacancy rate tightened in most markets as job growth sparked household formations, although vacancy has ticked up in some submarkets where an inordinate volume of new rentals were delivered. However, the strength of demand drivers will support a tight range of vacancy and solid rent growth throughout 2015 in most areas. rent gains is supporting an elevated volume of activity among investors. Debt and equity continue to rush into the sector, driving up the number of deals and dollar volume, as well as placing upward pressure on prices. Transaction velocity rose across all price ranges through the second quarter and the total number of sales could surpass the peak established 10 years ago. Nationwide, cap rates have tightened considerably over the past few years. The pace of cap rate compression in the largest markets eased recently as investors increasingly sought higher returns in secondary and tertiary markets. 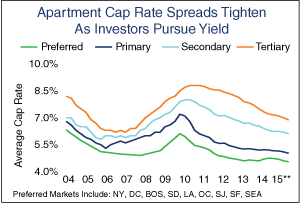 The range between cap rates in the best primary markets compared to tertiary markets peaked at 370 basis points in 2011, and the spread has since tightened to 230 basis points. First-year returns in primary markets are in the 5.0 percent range, on par with lowest level on record. The average in secondary markets of 6.1 percent and 6.9 percent in tertiary locations,are still higher than set in the last cycle. These spreads provide arbitrage opportunities for owners selling assets in leading metros. percent and the 10-year U.S. Treasury remains relatively wide at 320 basis points, but continues to tighten as intense sales activity pushes down first-year returns. 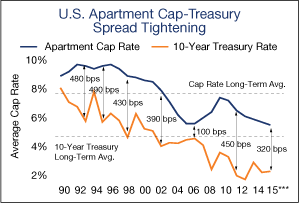 As investors seek opportunities in secondary and tertiary markets throughout 2015 and compress cap rates there, the spread nationwide to the 10-year will continue to narrow. The rate on the 10-year has been subject to little upward pressure, and even the anticipated increase in the Federal Reserve’s benchmark later this year will likely have minimal short-term effect on long-term rates. Inflation remains low and below the central bank’s target level, reflecting the strong dollar and low energy prices, indicating the Fed has the maneuvering room to adjust rates very slowly. This entry was posted in Commercial Real Estate on August 3, 2015 by ivycommeblog.